If you were to ask a non-Girl Scout what Girl Scouting is about, what would they say to you? Cookies? Crafts? S’mores? Well, we’re here to tell you, Girl Scouts is way more than Cookies, Crafts and S’mores! In a recent study of nearly 2,000 Girl Scout alumnae, 49 percent described “camping trips” as one of the most positive aspects of their Girl Scout experience—ranking it just behind “fun” and “friendships with Girl Scouts.” (GSRI, 2014) This comes as no surprise when you consider that Girl Scout camp gives girls a chance to have FUN with both OLD AND NEW FRIENDS! Camping is considered the number-one most memorable outdoor activity in Girl Scouts (GSRI, 2014)! 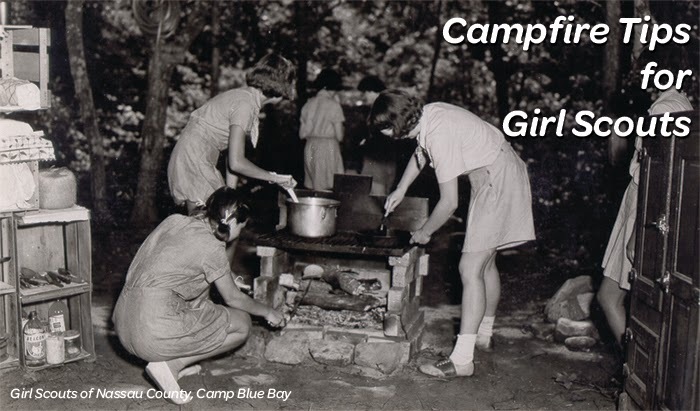 Girl Scout camps like GSNC’s Camp Blue Bay continue to be a key part to the Scouting experience. They provide outdoor experiences including camping in tents, swimming, outdoor cooking, playing sports and boating. Most importantly, Girl Scout camp gives girls the opportunity to be outdoors, relax, make new friends, try new things, be independent and most importantly have FUN. 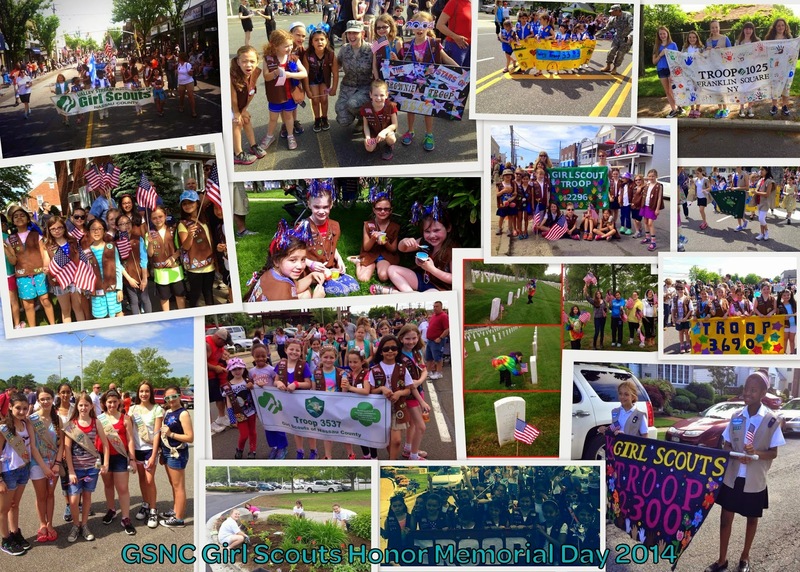 How did Girl Scouts Honor Memorial Day? How did you honor Memorial Day? Yesterday (May 26th) was Memorial Day. Girl Scouts in Nassau County honored and remembered those men and women who died while serving in the U.S. Military by marching in the Memorial Day parade, waving the United States Flag, putting flags out at the cemetery and planting flowers. Share your stories with us on Facebook or Twitter. Make sure your camp fire is in a safe, contained area away from shrubs, low hanging trees, equipment, buildings, etc… many campsites have spots designated for campfires. Keep a water bucket close by so that you can quickly put the camp fire out. Never leave a camp fire unattended. Make sure the fire is completely out before leaving it. Check with the local fire department about local regulations on camp fires. Always keep your hair tied back or under a hat or bandana. Avoid wearing loose clothing around campfires. Girl Scouts and all children should be supervised by an experienced adult around camp fires. Finally… to be fully prepared for Camping and the Outdoors, Girl Scout Volunteers should take the Outdoor Training Class offered by your local council. You will learn what you need to know for a successful camping experience with your Girl Scouts. 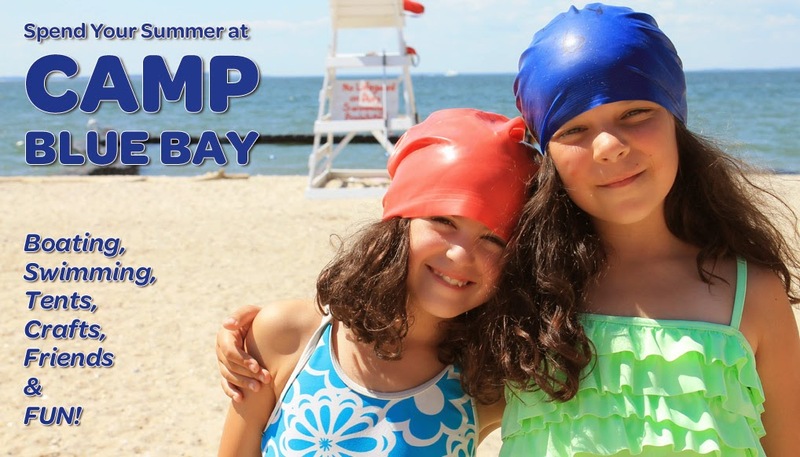 Girl Scouts of Nassau County offers a wide variety of camping experiences for girls including, Troop/Group Camping, Camp Blue Bay Sleepaway Camp, Council Camping Programs and Summer Adventures Troop Camping. 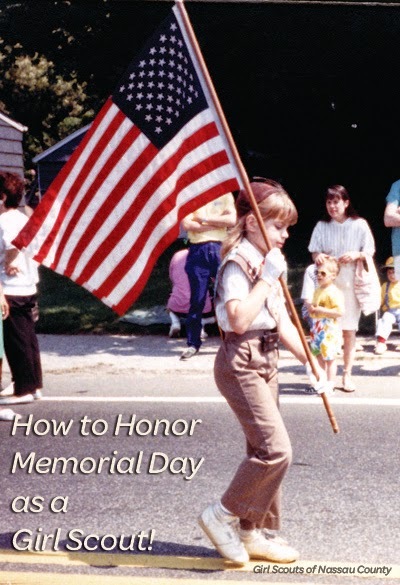 How to… Honor Memorial Day as a Girl Scout! Memorial Day is not just the unofficial start of the summer, but a day for us to honor and remember those men and women who died while serving in the U.S. Military. Memorial Day is a day to remember those who have served our country. This year, Memorial Day is Monday, May 26! Did you know that Memorial Day was originally called Decoration Day? One way to honor Memorial Day is to learn the history behind the holiday. Start out the day by participating in your community’s Memorial Day Parade… Wear your Girl Scout Uniform, present your Girl Scout Troop’s banner, wave your flags high and march forward with honor. Remember to take tons of pictures and share them with us on GSNC’s Facebook. If your town has a monument to those who served, take a Troop trip to that monument to reflect and respect those who served… Before your trip, have your Girl Scouts research the history of the monument. When was the monument placed? Are there specific people whom it honors? Spend the day with your family and friends… Memorial Day is the unofficial start to the summer and it should be spent enjoying the outdoors with your friends and family. Maybe get your Troop together and work on your cooking badge, like Junior Simple Meal badge or the Ambassador Dinner Party badge, by planning a BBQ for the Troop and its family members. If you are looking for Memorial Day resources for your Troop visit the GSNC Resource Room or visit the GSNC “Holiday Cheer” Pinterest Board. Excitement was in the air and smiles were on faces Wednesday as Girl Scouts who sold at least 500 boxes of Girl Scout Cookies enjoyed an evening of ice cream sundaes and rewards from the 2014 Girl Scout Cookie Season. The 500+ Club CEO’s Reception was part of the rewards options for Girl Scouts who sold at the 500 plus level. 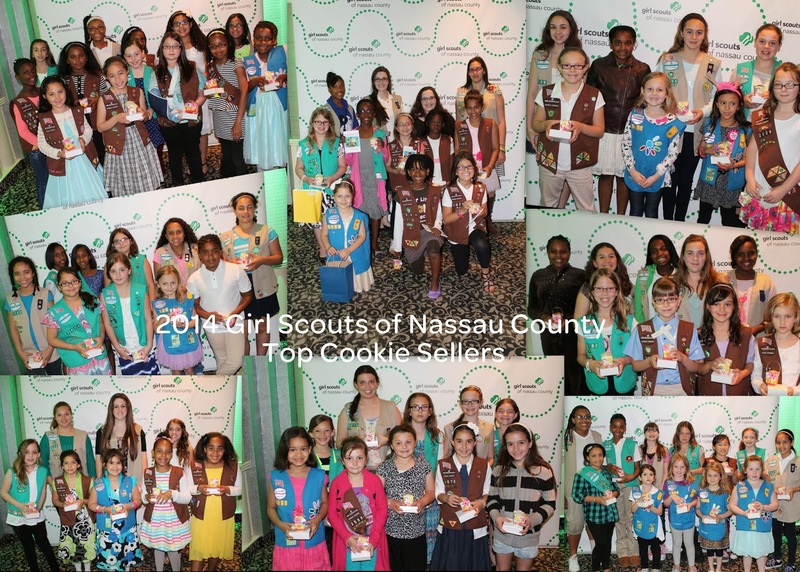 Congratulations to all of the Nassau County Girls Scouts who are now part of the 500+ Cookie Sellers Club and congratulations to all the Girl Scouts who reached their sales goal for the season (no matter the level). For these Girl Scouts, this party truly was the cherry on top of a successful cookie season! 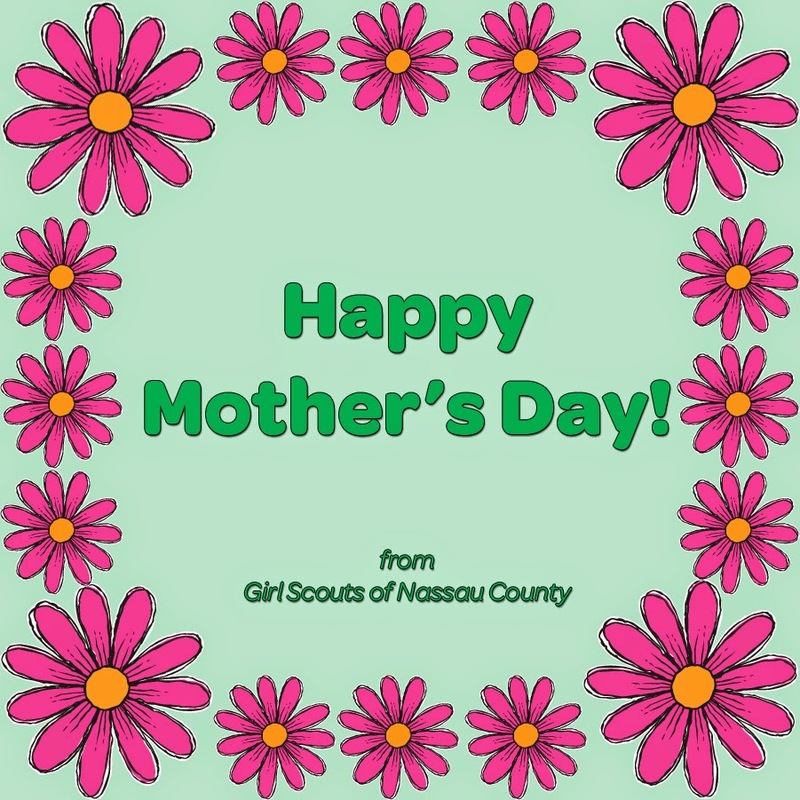 Happy Mother's Day from GSNC! Mother’s Day may be Sunday, and we would like to wish a wonderful Mother’s Day weekend to all the moms in the world. May you be LOVED and pampered – with maybe just a few minutes to relax and reflect on joys and responsibilities of motherhood.